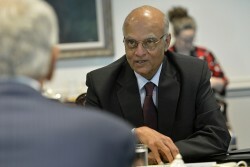 Shivshankar Menon, former Foreign Secretary and National Security Adviser of India, who speaks some German, will visit Vienna in April, where he regularly visited the IAEA from 2008 to 2014, as a member of India's Atomic Energy Commission. At a time when tensions between India and Pakistan are particularly high, he will talk about "The New Asian Geopolitics". Shivshankar Menon (1949), former Indian Foreign Secretary in the Ministry of External Affairs from 2010 bis 2014 and National Security Adviser of India under Prime Minister of India Manmohan Singh, is an Indian diplomat who comes from a family of diplomats. This article includes a total of 712 words.